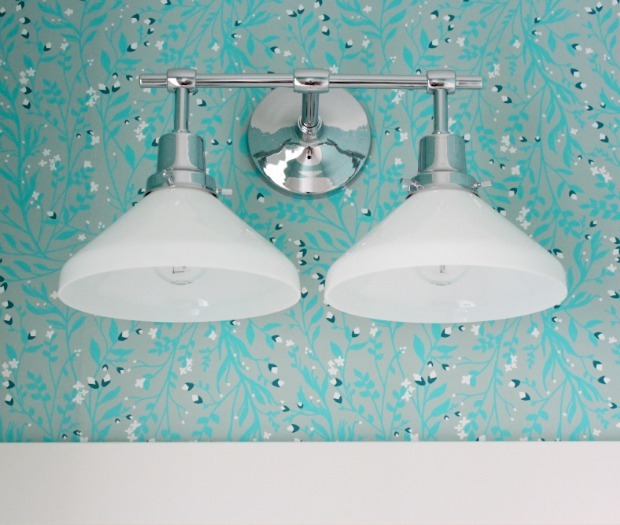 Want to update your bathroom lighting? Check out the vintage-inspired double sconce light fixture we selected from Rejuvenation to install in our powder room. Thank you to Rejuvenation for collaborating on today’s post and helping us get one step closer to finishing our powder room renovation. Affiliate links are included for some of the light fixtures. When I finally picked this project back up, my first order of business was finding a new light fixture. Seemed simple enough, but the double sconce I envisioned for the space didn’t seem to exist. My search finally came to an end when I spotted the perfect one from Rejuvenation. If you appreciate classic and vintage-inspired design as much as I do, you’ll probably want one of everything after you look through Rejuvenation’s beautiful selection. I chose the Eastmoreland light fixture for our powder room, and started a wish list for more items I’d like for the rest of our house. You must check out their hardware, mirrors, pendants and more. Absolutely gorgeous! To keep the bathroom finishes consistent throughout our house, I selected polished chrome. Most of their sconces also come in antique copper, brushed nickel, oil rubbed bronze, old brass and more. 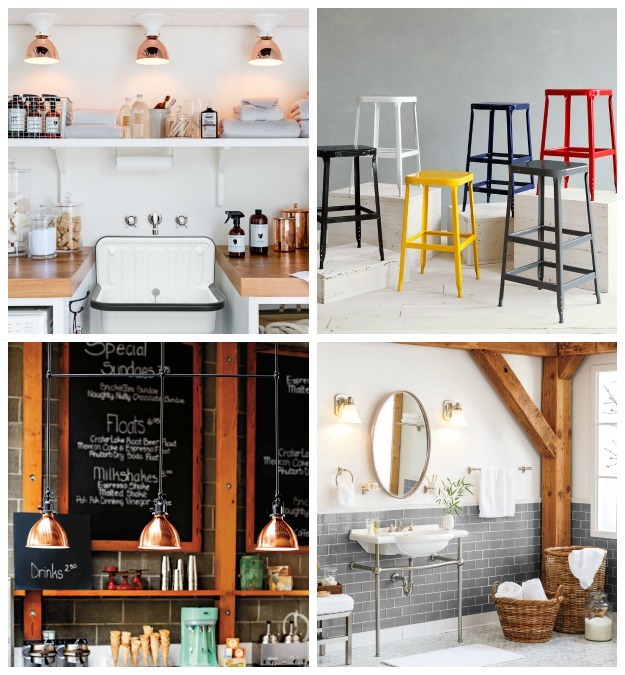 I’m definitely considering some of these other options for our kitchen renovation. There’s a style for everyone with 30 different shade options. I like how the ones I chose resemble milkglass and allow light to diffuse throughout the room. Definitely something to keep in mind when selecting a fixture for your bathroom. The Eastmoreland sconce is made to order, but Rejuvenation also has some beautiful quick ship lighting if you’re pressed for time. 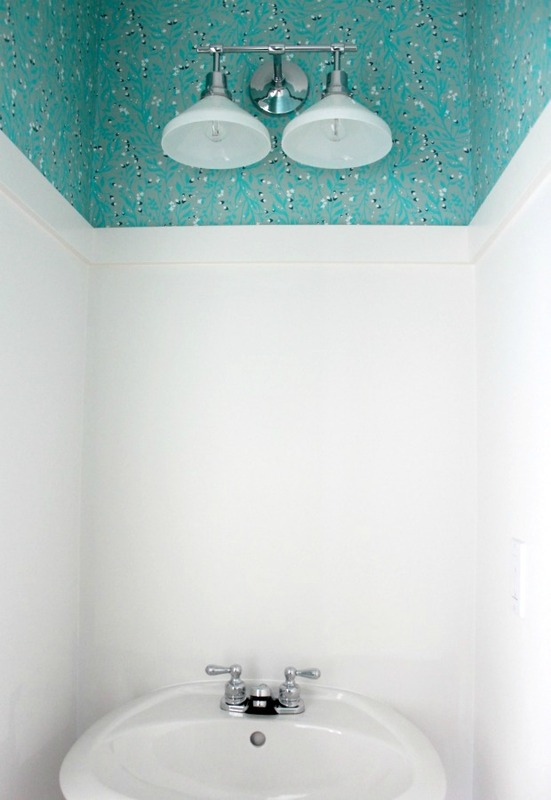 So, what’s left on our Project Powder Room list? 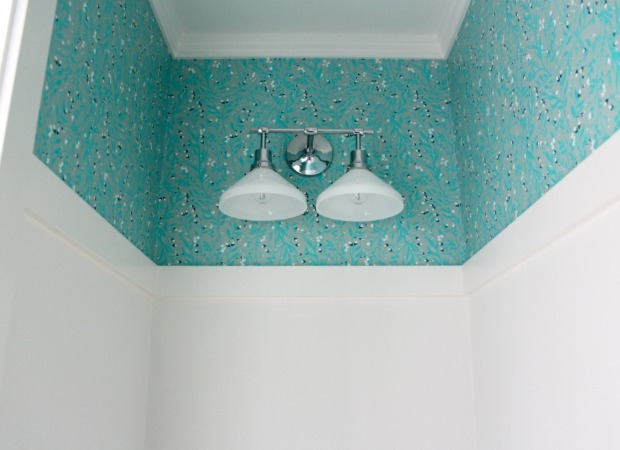 Add decorative details (including a secret project): that was the wallpaper! We’re getting there! Next up is installing the tile floor followed by the baseboards. The mirror, towel bar, toilet paper holder and some of the other decorative details are waiting in my office to go up. Rejuvenation wants to help you with your next home improvement project. Enter for your chance to win $250 USD in Rejuvenation products! Open to Canadian and US residents only (void where prohibited). That fixture looks great! We’re currently updating our sunroom. We are updating our bathroom. Your light looks great! I love their lighting! We are currently working on fixing up the living room. we need to replace our stairs and railings and also our master bathroom next! Love the direction you’re taking this powder room! Light and wallpaper look gorgeous together! The plan this summer is to tackle our boys’ bathroom upstairs. For some reason they would rather use our bathroom than theirs and it is driving us crazy! Love the light fixture! I’m torn about which project to tackle next in our house. I’m thinking the downstairs guest bedroom and bath, but that sounds like a lot of work! We’re putting in a new bathroom and redoing the kitchen. Your powder room is looking good! Love that light fixture! Thanks for the chance to win! I’m hoping to paint the living room and my girls’ room next. Your Powder room looks great! We are working on my laundry room, shelving and new flooring. What a job. We are working on a powder room too, we have the walls up and painted, floor done and I bought a potty – that’s it! I’d love to win a Rejuvenation gift card, thanks for the chance to win and love your scone, it looks great against that lovely wallpaper! Oh! It looks great. And we need a light fixture too! My entryway. It needs some work. We have a million projects on our to do list. I would love to win! LOVE Rejuvenation! Have several light fixtures from them. Starting a VERY big project soon so would love the help! Thanks for the opportunity! Hi Shauna, Your powder room is looking great, I can’t wait to see the final pics. We are working on our master bathroom, I Love Rejuvenation and would be extatic if I won. I currently am working on the bathroom in the basement. The faucets have to be replaced. I have a few lights I would love to replace! But I also want to work on my office space too! Love the light fixtures! I just installed a gorgeous light from Rejuvenation in the foyer of my 104 year old. My next project is a new garage and mudroom. I could really use some exterior lights from Rejuvenation to give it some period character. This is really great. Thank you for sharing. We are redoing the master bath this year. Updating my kitchen right now. love the light! thanks for the giveaway – I just finished fixing up my crappy old broom closet. Crappy no more! We have several little jobs that we want to do…replace some taps, change toilets, etc. We’re planning on a Kitchen renovation this Summer. We are planning to build a fence and paint. Hi Shauna, We have many projects in the wings at our home but what is next is a bathroom remodel. It was fun following you and thanks for the inspiration! We’re planning on building a deck. It’s a new house with a blank yard. Haven’t even sat in it once to have a coffee. we are working on our master bedroom and ensuite next. in the planning phase now, trying to collect our materials. Ive just completed a guest bath so your post rang many bells with me! At the moment I’m a bout half way though a huge kitchen reno . I think once i got one room started I have the reno bug and want to do the entire house! Your bathroom is looking amazing – almost done. I love the stuff from Rejuvenation! I am up to my eyeballs with our master bedroom retreat reno, this would come in SO handy and the fact that I love Rejuvenation, score! Fingers crossed! I will be renovating the laundry room area. There is decades-old plumbing there that needs to be replaced along with the flooring & shelving. Honestly… I need to update EVERYTHING in my house. We have a townhouse that was built in the 90’s. Big but SO OUT OF DATE! 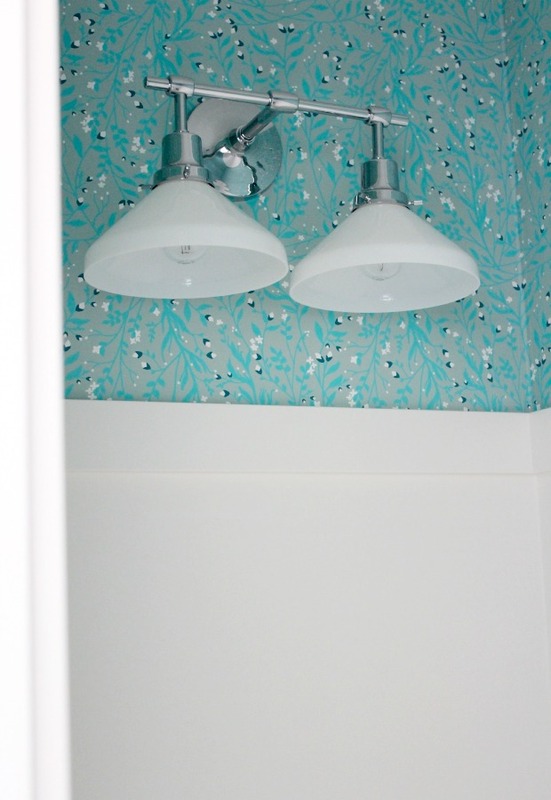 The powder room and the kitchen are the first projects that need to be tackled. Getting close now…can’t wait to see how it all comes together! We are currently working on a sunroom. But my main bathroom needs an overhaul. It’s next on the to do list. We are wanting to renovate our washroom. I am currently working on the basement. Just painted, next is the bathroom. We are working on our new office room. Were updating our cottage as our next project! I’ll be doing some renos in the kitchen soon. I am planning on redoing my bathroom and back sitting area! oh my goodness that wallpaper! Love it! Thanks, Ariel! I found that it did the trick to wake up that small space.